CT's top guy Justin Forde of Brien McMahon will not be at States, but there are a trio of guys competing who have soared beyond 22 feet. Sean Dixon-Bodie of Bloomfield has gone to 22-10.25 this season though he was 10 inches shorter than that while winning Class S. Hillhouse's Neal Eley will be seeded 1st for his M winning leap of 22-3.75. LL winner Jahiem Spruill of Norwich FA has a season's best of 22-1.5. Dixon-Bodie's jumping partner Anthony Simpson went to 21-10.75 at the Class S meet. The high jump should be a great contest pitting this year's US #2 jumper Chet Ellis of Staples at 6-10 against the reigning champ Ja'kwan Hale of Derby who has cleared 6-8. Others in the hunt include #3 seed Chaddane Williams of Bloomfield who jumped at 6-4 in Class S, Peter Fuller of Canton who has cleared 6-6, and Shaun Graham of Amity and Jahiem Spruill of Norwich FA who are seeded at 6-2. Four CT guys have cleared 14 feet this year, and they are expected to make this CIAC event one of the top competitions. Class S champ Hayden Rovelli of Coginchaug has a season's best of 14-10, L winner Jacob Bazinet of Norwich FA has hit 14-2, and M winner Aidan O'Connor of Lewis Mills and runner-up Nicholas Constantini of Foran have done 14-0. Two other guys in contention include LL runner-up Jake Lavalette of Glastonbury and M's 3rd place finisher Joey Hinckley of Stonington at 13-6. 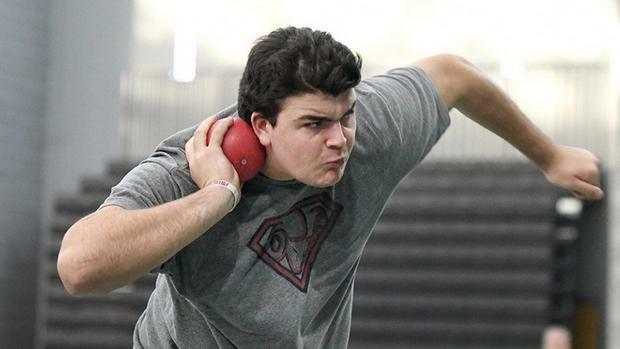 Last year RHAM's Michael Browning won with 53+ toss, but this year the L Class champ could be looking for something north of 60 after hitting 59-0.75 last weekend. L runner-up Jonathan Prell of Simsbury hit 55-9, LL winner Nathan Quaye of Manchester has done 54-9, S winner Aaron Williams of Bloomfield is at 53-11.75, and Windham's Natanael Barbosa and Norwich FA's Cameron Belton have gone over 53, so things could get lively here.